Police alert users to a possible 'bad batch,' and increase patrols and education efforts as heroin and other drugs tighten their grip on the city, killing two. At least 14 people overdosed on heroin and other opiates in a 24-hour period last weekend in Portland, heightening concerns about the region’s drug epidemic and whether a particularly dangerous supply is circulating on city streets. Five of the 14 individuals were in cardiac arrest by the time paramedics arrived, and two died as a result of the overdoses between 8 a.m. Friday and 8 a.m. Saturday, city officials said. By comparison, the city’s emergency medical services and police typically respond to five or six overdoses of all types – including non-opiates – during a 24-hour period. The spike in overdoses and problems with discarded needles at some Portland parks have prompted city officials to launch a public awareness and education initiative, as well as stepped up police patrols in problem areas. City officials are expected to hold a news conference Wednesday to discuss the recent rise in opiate-related overdoses, and the ways that Portland is trying to address the issue through increased police patrols, public outreach and calls for more treatment resources. The city also is attempting to increase awareness of a needle-exchange program that is used to inform addicts about risks and treatment options. Heroin abuse and overdose rates are up sharply in Maine and across the country, in both big cities and small towns, reflecting increased availability of the low-cost street drug at a time when prescription opiate painkillers are becoming harder to find and more expensive to buy. Many users become addicted to painkillers first, then turn to heroin to feed their addictions and avoid going into withdrawal. The number of people who died in Maine from heroin jumped from seven in 2011 to 28 in 2012, then to 34 in 2013 and 57 in 2014, according to statistics from the Chief Medical Examiner’s Office. Also, the number of overdose deaths involving fentanyl – a powerful opiate prescription drug often combined with heroin or sold as straight heroin to unsuspecting buyers – grew from 9 to 43 in that time period. Fentanyl has emerged as a prime concern because it is up to 40 times stronger than heroin and increases the risk of potentially fatal overdoses when it is mixed into heroin to amplify the drug’s effects. It was unclear whether any of the 14 overdose victims – including the two fatal cases – involved fentanyl. But such sudden spikes sometimes stem from a “bad batch” of drugs, which can be unusually pure or laced with other substances that increase the risk of an overdose. Meanwhile, the number of Mainers seeking treatment for heroin addiction swelled from 1,115 in 2010 to 3,463 last year, according to the Maine Office of Substance Abuse. Nationally, the number of people addicted to heroin has more than doubled in a decade, from 214,000 in 2002 to 517,000 in 2013, according to a study released this year by the Substance Abuse and Mental Health Services Administration. Although the problem in Maine is statewide, Portland and some neighboring communities are seeing larger numbers because of the population size. Portland Fire Chief Jerome LaMoria said his emergency medical personnel have administered the opiate overdose counter-agent Narcan – also known as naloxone – 20 percent more so far this year compared with the same period last year. Sauschuck and LaMoria would not release specific information about the 14 people who overdosed between Friday and Saturday in separate incidents. And because toxicology reports can take months to complete, it was unknown whether the overdoses were connected to a specific shipment of drugs into the city. Sauschuck did say it was clear that all 14 were caused by heroin or other opiates. Portland police have responded to the surge in heroin use by stepping up foot and bike patrols in key areas as well as reaching out to the community. The city’s Department of Health and Human Services is also sending a letter Wednesday to local pharmacists inviting them to a meeting to discuss the city-run needle exchange program. The program provides safety information and free, clean hypodermic needles to addicts turning in used needles, in an effort to reduce the risk of transmission of HIV, hepatitis C and other blood-borne diseases. City officials plan to ask pharmacists to help educate customers who use needles about safe needle disposal practices. One apparent “hotspot” for drug abuse using needles, Sauschuck said, is Deering Oaks park. “We have been finding them in various parts of the city, and this is something I see as a major public health concern, especially for our kids,” said Portland City Manager Jon Jennings. At Deering Oaks, parents were shocked Tuesday to hear that needles had been found in the ravine, which is located not far from the wading pool used by children. Jennings said he was not aware of any needles being found in the wading pool. 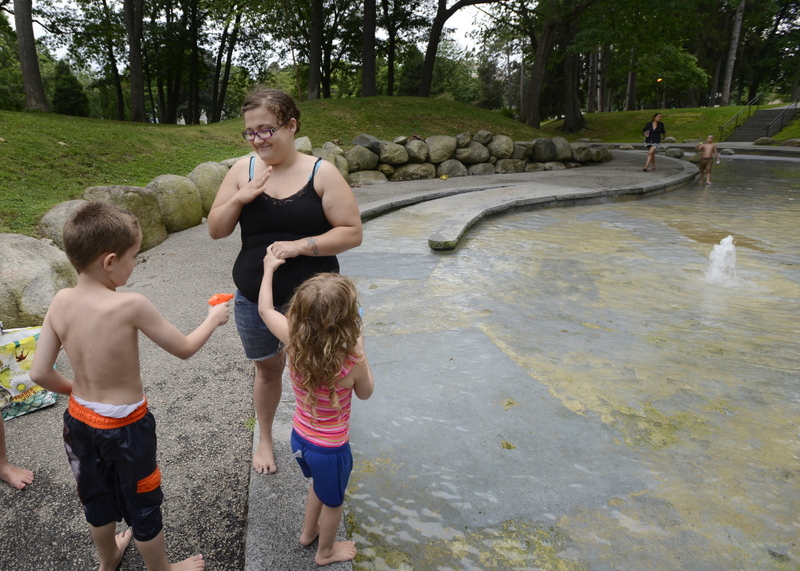 Megan Sargent, 26, and Doug Wright, 25, frequently bring their kids to the wading area in the park. Sargent, speaking in sign language, said she was “shocked” to learn of the problem and has never seen drug use or needles in the area. “We’ll definitely have to be more cautious,” she said. Wright, however, was not surprised to learn of the overdoses in the city, because it’s common knowledge that heroin use is growing in Portland. As a landscaper, he frequently encounters used needles and other drug paraphernalia. “It just continues to grow,” he said. Recreation crews and police also have increased their presence at Peppermint Park, a small park on Cumberland Street in the city’s East Bayside neighborhood. Several East Bayside residents expressed concern about the amount of drug and alcohol use in Peppermint Park, but most did not want to be identified because they feared retribution. One woman referred to the small park near the corner of Smith Street and Cumberland Avenue as “Needle Park,” and another man said he had personally found needles and reported it to the city. 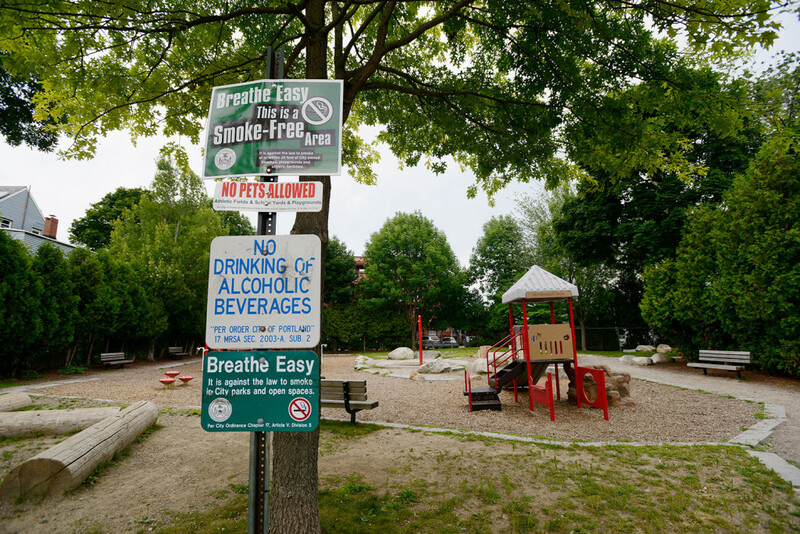 Drug and alcohol use is “pretty common” in the park, said Amanda Nobbe, a 24-year-old Anderson Street resident. “I don’t walk through that park after dark,” she said. Nicole Iriza, 18, agreed. She has lived on Cumberland Avenue for two years and periodically hears arguments and fights near the park.